Establishing solid foundations early in the contract and commercial relationship lifecycle is critical for contracts to work. But this process starts long before contracts are signed. Two recent NAO reports provide insights into the importance of getting both the procurement strategy and process right. Experience has shown that not doing so can result in millions of pounds in legal costs – £100 million in one recent case – or an uncompetitive contract leading to additional costs. This latest blog in our commercial and contract management series shares our recent insights across the market management and sourcing domain of our contracts lifecycle. Our November 2016 report, Commercial and contract management – insights and emerging best practice (introduced in our earlier post Government’s contracts – new insights into best practice) sets out 20 areas of insights into good practice. 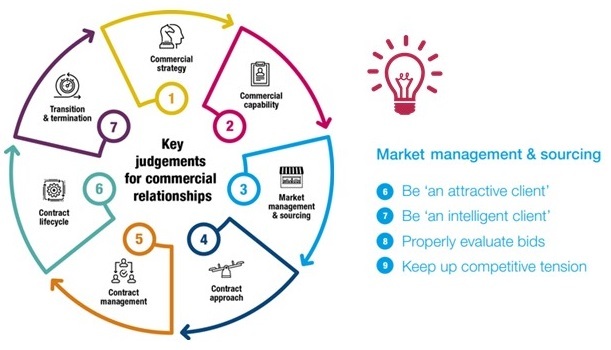 Four relate to ‘market management and sourcing’, as illustrated, including considering whether contracts represent a fair deal for contractors and are achievable. 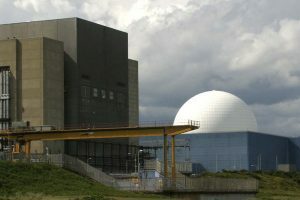 The Nuclear Decommissioning Authority’s (NDA) Magnox contract report considers the competitive procurement exercise for services to decommission two nuclear research sites and 10 sites comprising power stations that near or at the end of their operational life. The NDA awarded a 14-year contract, with an estimated value of up to £6.2 billion, one of the biggest government contracts ever put out to tender. Improving value for money in the non-competitive procurement of defence equipment: Given the inherent lack of competition across some defence areas, in 2014 the Ministry of Defence (MoD) introduced the Single Source Contract Regulations to provide better value for money for the taxpayer. The Regulations offer considerable opportunities to improve contract management. Far too often we see government expose itself to risk as it does not understand what it means to buy and what it should cost. Our recent NDA report reiterates the need for government to get independent assurance of its assumptions about the work it needs contractors to undertake. By March 2017 the NDA’s estimate of decommissioning costs had risen to £6.0 billion, compared to a winning bid of £3.8 billion. The NDA did not know if these increases related to underperformance by the previous contractor or NDA’s over-optimistic assumptions about the state of the sites when it tendered the contract. Subsequent costs were more than its contingency estimate for extra scope. We have continually seen insufficient due diligence undermining contracts. For example, for its Health and Disability Assessments contracts, the Department for Work & Pensions continued to set unrealistically high targets and use assumptions without sufficient evidence or challenge. Part of being an intelligent client is having accurate data on contracts, as well as on requirements that government wants to be provided. We found that a lack of good quality data on the MoD’s portfolio of non-competitive contracts created challenges for MoD in achieving savings. For example, as its contract database contained out-of-date information, the MoD struggled to identify the contracts due for renewal or amendment and that may fall within the scope of the Single Source Contract Regulations. Very few procurements are legally challenged. But we have recently seen a handful of examples where procurement has gone very wrong. And when it does, this has a significant impact on value for money. As described in our report, the recent ‘Magnox contract’ provides a startling lesson and reinforces the warning indicators we identified in our insights report (see right). In particular, it showed the need to create an understandable evaluation process, which could be easily applied with the right balance of criteria. In particular, following a legal challenge by an unsuccessful bidder in 2016, the High Court found that the NDA had not correctly applied pass/fail threshold requirements. 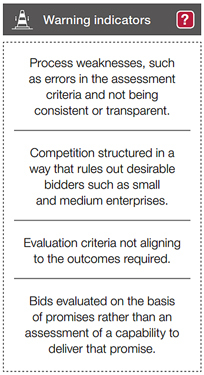 These requirements excluded bidders from the competition if they failed to include specific details in their bid. The Court found that if the NDA had applied its evaluation criteria correctly, the winning bidder would have been excluded from the competition. The NDA agreed to settle damage claims with the unsuccessful bidder leading to a £97.3 million settlement and a £122 million cost to the taxpayer, including legal fees. We often find that government does not approach contracts enough as a two-way process, and they do not think about the impact of their decisions on market sustainability and contractors’ views of government. The MOD’s reforms to non-competitive contracts partly aim to ensure that suppliers are paid a fair and reasonable price. It has worked with industry to determine the extent to which its work impacts on the financial health of suppliers. This is an important consideration in agreeing profit rates, alongside making savings where possible. More widely, for suppliers to want to work with government, they need to have confidence that they will be treated fairly and that processes and contracts will run as expected. Court cases, legal costs and a failure to apply expected processes, such as with the NDA Magnox contract, will undoubtedly have a wider impact on the attractiveness of working with government to suppliers. 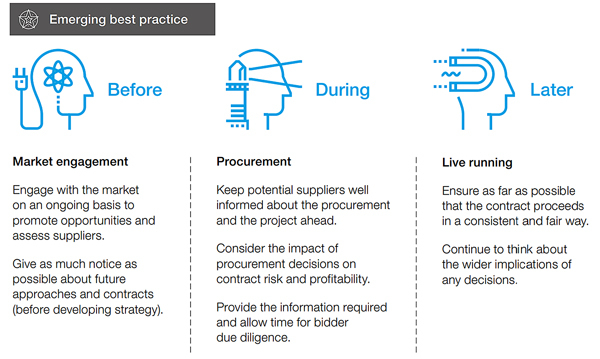 Commercial and contract management – insights and emerging best practice emphasises that competition can be taken further than assuring there are enough credible bidders in the procurement process – we touched on alternative approaches, such as where the market is insufficiently competitive. Our previous post, Intelligent contract competition and risk management, also considered the importance of keeping up competitive tension, as illustrated by the BBC’s work to sustain market competition for its television licence fee collection contract. Demonstrating the health of the market helps to increase the pressure on a supplier to provide a good service. Our recent non-competitive procurement report describes how, given the MoD’s unique position and the challenges in ensuring competitive tension, the MoD needs to take a more strategic approach to encourage competition. The government has created the Single Source Regulations Office, which addresses a lack of competitive tension in many large defence contracts by: recommending the profit rate for contracts; producing guidance on the types of costs are permitted within the contract price; and issuing opinions or determinations where a disagreement on costs cannot be settled through negotiation. More widely, the Single Source Contract Regulations greatly expand the requirement for suppliers to be fully transparent in their bid costs. This builds on previous NAO work on open book accounting (see our blog-post Contracting: A minimal open book approach). Through introducing the Single Source Regulations Office, the MoD expects to generate £1.7 billion of savings over the 10-year Equipment Plan. We will continue sharing insights from our work. We welcome your comments and invite you to contact us to discuss any of these issues in more detail. 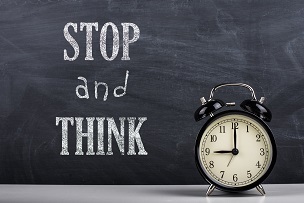 Please do sign-up to receive email alerts on future blogs to keep up-to-speed with our emerging thinking. 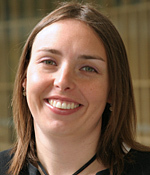 Emma Willson is an Audit Manager working in the Commercial and Contracting Community of Practice. The practice generates cross-government insight on commercial and contracting matters, develops best practice approaches and ensures these are applied across the NAO. Emma previously managed work and pensions related studies. Topics of past reports include contracted-out health and disability assessments, learning lessons from welfare reform and Personal Independence Payment. 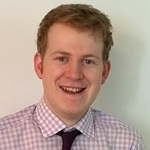 Iain Forrester is an Audit Principal who works in the Cabinet Office and cross-government value for money team and is part of the NAO’s Commercial and Contracting Community of Practice. Topics of past reports he has worked on include BBC radio, rural broadband and grants across government. In his recently published autobiography My Life, Our Times, Gordon Brown the former Prime Minister and self-styled prudent Chancellor discusses among other things, the financial crises which broke almost the moment he entered 10 Downing Street, and his government’s role in dealing with it as it spread swiftly to engulf the economy. Not surprisingly, he makes no mention of one of most disgraceful actions of his government, which is directly relevant to the subject matter of this blog post – failure to get both, the procurement strategy and process right can result in an uncompetitive contract being let. It can then degenerate into state-sponsored protectionism and favouritism being granted by the State to favoured contractors. This shameful episode, which marred Brown’s time in office, relates to the procurement of military equipment. What has been clear for many years is that, public subsidies handed out to defence equipment manufacturers over several decades, is the reason why they have failed so miserably, to deliver equipment to the Armed Forces which is fit for purpose, adequately sustained in-service and constitutes value for money through-life. In the UK, as in many western countries, the means of defence production, distribution and exchange is exclusively in the hands of private interests, that is to say, the State is entirely dependent on for-profit organisations for the design, development, manufacture and delivery of new military equipment to the Armed Forces. Consequently, the government has no choice but to rely on the Private Sector for all its military equipment needs, including its subsequent upkeep when in-service with the user. The harsh reality is that, no department of state in Whitehall is as dependent on the Private Sector, as is the Ministry of Defence – putting it at serious risk of capture by private interests (if it hasn’t already been) which allows them to bend policy to their will, as it relates to the expenditure of public funds. Equally, these private interests are entirely dependent upon a steady flow of taxpayer funds for their very survival – no least, because they have not bothered to diversify at all. For those not familiar with this concept of state capture, Transparency International, the anti-corruption watchdog, defines it as “a situation where powerful individuals, institutions, companies or groups within or outside a country use corruption to shape a nation’s policies, legal environment and economy to benefit their own private interests”. Consider the case of the Terms of Business Agreement on naval shipbuilding, signed by the Brown government with BAE Systems during the dying days of the 2005-10 Parliament, which left the incoming administration no room for manoeuvre at all, as it set about undertaking a comprehensive Strategic Defence & Security Review – for the first time in 12 years. In fact, this agreement was signed in secret, in 2009, precisely because it locked the government into an appallingly poor 15-year commercial arrangement laced with a punitive get-out clause which, if made public at the time, would have attracted criticism and negative publicity in the press and media during the run-up to the 2010 general election, potentially swinging the result in favour of the other party. The existence of the TOBA was only revealed to Parliament in 2011 by the Cameron-led coalition government, when it was confronted with the undeniable truth that MoD finances were in pretty bad shape and needed to be declared publicly, to garner public support for deep cuts in the defence budget that ensued. It is an open secret that the even the most fiscally prudent people in government are prone to softening their stance just before a general election, when they are up for re-election, which makes them more likely to open-up the public purse. Equally, defence contractors are aware of this weakness in top politicians and will take full advantage, by surreptitiously intensifying their lobbying efforts in cahoots with labour trade unions, to apply political pressure spliced with threats of massive lay-offs, timed to coincide with the electoral cycle, to relieve politicians off taxpayers’ money and maximise their take – which is exactly what happened with this TOBA. 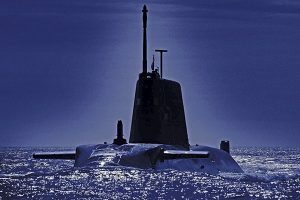 So, instead of exposing defence equipment manufacturers to the full rigours of the free market, that is, not shielding them from ‘feeling the heat’ of competitive market forces, the Brown government chose to engage in protectionism and blatant favouritism by handing out uncontested, long-term shipbuilding contracts worth billions of pounds – with virtually no checks and controls, or even guarantees which has come to haunt this minority government. Nevertheless, it has decided to honour the TOBA because it simply had no choice. What’s more, in a market such as that in military equipment, it has been long-standing policy to combine the role of the sponsoring agency and regulatory authority in a single department of state, the Ministry of Defence – which means that the crucial independent scrutiny function, free from political interference, is non-existent. So, capture of one amounts to taking control over both! Worse still, people at the Ministry of Defence are, without exception, favourably disposed towards the defence industry because they are completely dependent upon it for their subsequent career choices (via the revolving door), when their time in public service comes to an end, or their contract is terminated abruptly by political edict, as is happening right now. Indeed, it is very hard to find anyone at MoD who will aggressively defend taxpayers’ interests once they have enjoyed a cosy relationship with contractors. It is fair to say that they certainly know which side their ‘bread is buttered’! It is precisely to overcome this disastrous state of affairs that the government should set the objective of pulling back from the defence equipment market and allow the Private Sector to take-over, so that it can make the necessary capital allocation decisions for itself, as it relates to the development of its own products – instead of continually looking to intervene in the market with public funds which, as history has shown, will always be squandered. The NAO describes ‘ideal type’ public procurement/commissioning. That’s useful. But a)is it feasible and b) at what cost? b) being such an intelligent customer isn’t cheap. Can we be sure the extra contractual costs (employing market analysts for example) are included in the transaction accounting? Many thanks for your comment, David, it’s a good challenge. Undeniably, establishing ‘ideal’ public procurement / commissioning for all government contracts would be both unrealistic and inefficient, particularly in light of the stringent efficiency and savings measures in place across the public sector. Indeed, doing so could well see the NAO knocking at people’s door to assess the value for money and effectiveness of establishing such ‘ideal’ processes for all contracts. For example, our report on DWP Contracted out health and disability assessments recommended that DWP tailor its resources to future risks, as we have seen being the case in a number of government departments. Insight 3 of our publication Commercial and contract management: insights and emerging best practice recognises that government has insufficient overall capacity to resource everything it needs. Thinking more specifically about investing in becoming an ‘intelligent client,’ bringing in specialist market analyse skills will clearly help, but government can also think about other ways to stay ahead. Less resource-intensive techniques we have seen include using open book to understand how existing contracts work (insight 14), thinking early about the data and information required from a contract to transition effectively (insight 19); and having regular (informal/ formal) dialogue across the market on latest developments and opportunities (insight 15). This allows an ongoing dialogue with suppliers to encourage a mutual understanding of what can be achieved and delivered.